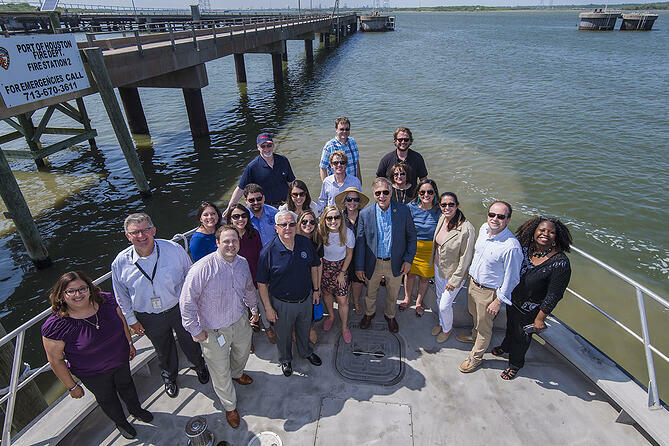 U.S. Rep. Brian Babin and his staff took a waterside tour of the Port of Houston May 31, with Port Houston staffers providing a briefing for the Congressman along the way. During the briefing, Port Houston staff highlighted the importance of the Houston Ship Channel. They focused on the need for improvements to accommodate two-way traffic and the larger vessels calling the port. The ship channel is the busiest waterway in the nation in regard to vessel and barge transits. Port Commissioner John D. Kennedy joined Babin and his staff on a port fireboat as they visited the Barbours Cut Container Terminal, noting that staff provided information on Port Houston and federal policy priorities. Port Houston Director of Channel Development Mark Vincent provided an overview to the group on the channel and port’s latest infrastructure developments. A national asset, the greater Port of Houston generates $618 billion in U.S. economic activity annually.